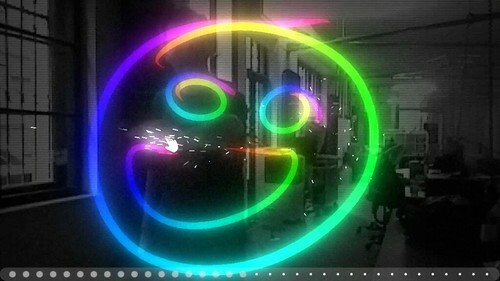 It is a gesture controlled drawing application where the resulted drawings look like neon glow. The idea was to make the visuals similar to the traditional light graffiti that you can create with a light source photographed with long exposure. Also pay attention on how we handled the gesture of lifting the "spray" by the multiplication and parallax effect on the hand cursor. We used elastic physical simulation algorythm similarly as in Paul Haeberli`s historical DynaDraw to augment the users` actual gestural movements.